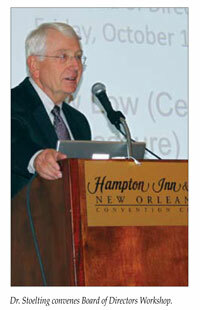 Dr. Robert C. Caplan, member of the APSF Executive Committee and of the ASA Closed Claims Group, and staff anesthesiologist at Virginia Mason Hospital in Seattle, WA, moderated the workshop which included a list of speakers nationally and internationally recognized for their expertise in neuroanesthesia, outcomes research, and research on the use of deliberate hypotension. Dr. David Cullen, previous chair in the Department of Anesthesiology at Tufts Medical Center, reviewed his case series of 4 patients who developed severe and permanent brain or spinal cord infarcts after having anesthesia with deliberate hypotension in the beach chair position. He reported that he was aware of an additional 11 cases in which patients suffered severe brain damage under similar circumstances. Dr. Cullen believes that anesthesia care providers need to maintain blood pressure at or near baseline levels in the sitting position. He provided the following recommendations to avoid hypotension in the sitting position: 1) titration of anesthetics to avoid excessive depth of anesthesia; 2) minimizing sudden changes in position; 3) administration of intravenous fluids to offset the effects of NPO status and the sitting position on venous return; 4) use of vaspressors to maintain blood pressure, as needed; and 5) correction of blood pressure for the difference in height between the site of measurement and the brain (1 cm height = 0.77 mmHg or 1 mmHg = 1.25 cm height) . Dr. Daniel I. Sessler, chair of the Department of Outcomes Research at the Cleveland Clinic presented preliminary data from a retrospective study of 24,000 patients undergoing volatile anesthesia with Bispectral Index (BIS) monitoring. Dr. Sessler’s group examined combinations of mean arterial pressure ≤75 mmHg, BIS <45, and minimum alveolar concentration (MAC) <0.7 (each averaged over case duration). Thirty-day mortality was similar in patients in whom only a single average was low and in those with no low averages. However, 30-day mortality was doubled when 2 were low averages, and tripled when all 3 were low. A Triple Low of MAP, MAC, and BIS is thus an ominous predictor of postoperative mortality. Dr. Sessler described additional preliminary and unadjusted data demonstrating that 20 or more minutes of a Triple Low was associated with prolonged hospitalization and a 3-fold increase in mortality. The team also found that mortality was no higher than normal when patients were given a vasopressor within 5 minutes of entering a Triple Low. Dr. Sessler cautioned that these results are based on retrospective data and preliminary analyses, and that prospective study would be required to validate these findings. 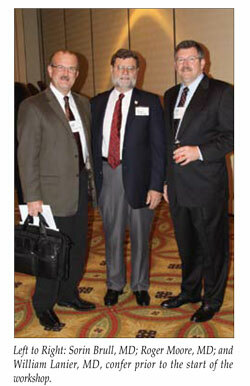 The study was supported by Aspect Medical and some coinvestigators are Aspect employees. Dr. Nigel E. Sharrock, staff anesthesiologist from the Hospital for Special Surgery in New York, reviewed his experience with the use of deliberate hypotension in elderly patients undergoing hip surgery. He and his colleagues have published multiple papers on the use of this technique for minimizing blood loss, and its safety in elderly patients. Their anesthetic technique includes lowering the MAP to 45 to 55 mmHg, epidural anesthesia, and an epinephrine infusion to augment the cardiac output. He noted that when his center initially started using deliberate hypotension to a MAP of 50 mmHg with epidural anesthesia (without epinephrine) for hip surgery to decrease blood loss, patients would complain of feeling light-headed. A variety of vasoactive agents were used to augment the cardiac output, and epinephrine proved most effective for eliminating the presyncopal symptoms. Dr. Sharrock’s studies have shown that the epinephrine infusion significantly raises the cardiac output under these conditions. He believes that is why these patients did not have any significant increase in complications compared with control patients who had their MAP maintained between 60 to 70 mmHg. Complications that were examined included stroke, myocardial infarction, and postoperative cognitive dysfunction. Dr. Sharrock has examined small subsets of patients including those with hypertension (n = 31) chronic renal dysfunction (n = 54), moderate to severe aortic stenosis (n = 22), or low ejection fraction (n = 29). He has found no significant increase in complications in any group utilizing deliberate hypotension compared to patients kept normotensive. He has also studied postoperative cognitive dysfunction (POCD) in patients receiving hypotensive anesthesia compared to those in a normotensive group. At 7 days and 4 months postoperatively, there was no significant increase in POCD in the hypotensive group compared to the normotensive group. It was noted that hip surgery is performed in the lateral decubitus or supine position where the heart is relatively equal with the head level and the lower body. In contrast, the beach chair position places the lower body dependent to the heart, thereby decreasing venous return and cardiac output. The satisfactory outcomes in Sharrock’s studies may be partially attributed to good venous return and augmented cardiac output associated with the use of low dose epinephrine. Dr. Joseph A. Bosco, vice chairman of orthopedic surgery from New York University Hospital for Joint Diseases, described the surgical rationale for the use of deliberate hypotension for shoulder surgery. He explained that the surgeon may find it difficult to visualize the operative field through the arthroscope if there is significant bleeding, and that injured tissue can be hyperemic and prone to bleeding. Raising the pressure of the irrigant can be problematic because it may lead to swelling and compartment syndrome in the shoulder. Dr. Bosco noted the beach chair position facilitates the arthroscopic access to joint structures, and presents these structures in a manner that is anatomically straightforward. He noted, however, that younger surgeons are now being trained to perform arthroscopic shoulder surgery in the lateral decubitis position. Dr. James R. Munis, head of the Division of Neuroanesthesia at the Mayo Clinic, provided a brief physiologic review of the differences in cerebral perfusion pressure in a “siphon” or closed vascular system compared to a “waterfall” or open system. He believes that cerebral perfusion pressure should be maintained at or near awake levels by keeping the blood pressure (measured in the upper arm) at the baseline awake level. He does not believe that is it necessary to correct for the difference in height between the head and heart level. Dr. Munis believes that correcting for the height difference and maintaining awake MAP values at the head level would essentially make the patient hypertensive. Dr. Michael J. Souter, a neurointensivist and acting chief of Neuroanesthesia at Harborview Medical Center in Seattle, WA, discussed the ideal way to monitor for adequate cerebral perfusion. He noted that the goal is to avoid cerebral ischemia. In the absence of proven modalities, he highlighted monitoring techniques explored by Moritz and colleagues (Anesthesiology 2007) in awake patients undergoing carotid endarterectomy with regional anesthesia. They found that using the percent change in transcranial Doppler flow velocity and in near infrared spectroscopy (NIRS) proved the most valuable tools for assessing adequacy of cerebral perfusion in relation to ischemic symptoms. Neither stump pressure nor somatosensory evoked potentials were as useful. Dr. Souter noted that 2 of 4 patients reported by Pohl and Cullen had posterior infarcts, so the ideal approach to monitoring should include the ability to assess multiple areas (e.g., anterior and posterior) of the brain. He reminded the audience that McCullough’s data showed an intact or “classic” Circle of Willis in only 34.5% of 1,413 brains. Anesthesiology 1997). Dr. Drummond believes that the available evidence favors a lower limit of 70 mmHg in the heathy and normotensive adult in the supine position, rather than the conventional or classic limit of 50 mmHg. Dr. Drummond commented that his most recent chapter in Miller has been modified to reflect this change in interpretation of available studies. He also emphasized that over 45% of the population has an incomplete circle of Willis, which may decrease the autoregulatory capacity. Dr. William L. Lanier, professor of Anesthesiology at the Mayo Clinic in Rochester, MN, and editor of the Mayo Clinic Proceedings offered closing comments. He stated that we currently lack any reasonable outcome studies because the incidence of severe and dramatic injuries is low. Dr. Lanier called for research studies that prospectively test for changes in postoperative cognitive function in patients undergoing anesthesia in the beach chair position, with specific emphasis on the relationship between blood pressure and cognitive function. This may be the most “sensitive” way to detect a critical threshold. He noted that it may be difficult to identify all high risk patients, which increases the need for sensitive and specific methods for intraoperative monitoring. He concurred with other speakers that we need a monitor to assess cerebral function in multiple regions of the brain. Dr. Lanier remarked that NASA already uses much more advanced monitoring technology in space and aviation medicine, so there may be a way to improve our care with better technology. He noted that general anesthesia and deep sedation may adversely affect cerebral blood flow distribution by blunting the sympathetic response to blood pressure homeostasis. He also noted that anesthesia may also prevent or inhibit behavioral activities that prevent ischemia, such as limiting one’s degree of head rotation in the presence of spinal stenosis. He believes that we should err on the side of caution in using deliberate hypotension in the beach chair position until we have better information. 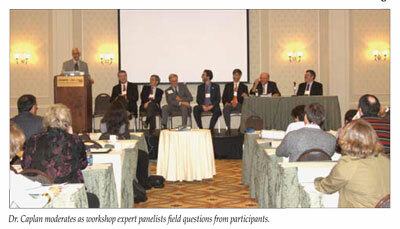 After the presentations, the audience and speakers participated in a “question and answer” session. Dr. David Cullen reiterated his belief that the risk of cerebral injury in the beach chair position could be viewed at a “macro” level by focusing on an acceptable lower limit for blood pressure. Dr. Richard Prielipp questioned whether or not positive pressure versus spontaneous ventilation affected cerebral perfusion, and whether a low PaCO2 might contribute to low cerebral blood flow as well. Dr. Steven Rupp thought that determining the incidence of severe neurologic injury is essential as the ASA Closed Claims data are not revealing. 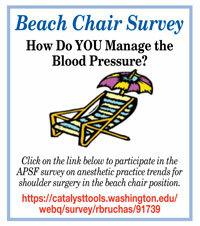 Group 1 was charged with the question of “What further research needs to be done?” As a starting point, the group suggested that the APSF conduct a poll to determine the range of anesthetic practice for shoulder surgery in the beach chair position and whether practitioners know of any cases of severe brain or spinal cord damage after shoulder surgery in the beach chair position. The group also suggested a study of national databases to identify any association between shoulder surgery in the sitting position and postoperative cerebral injury Many felt that a registry of these catastrophic outcomes, similar to the ASA Postoperative Visual Loss Registry, would be useful in light of the low incidence of this complication. Prospective studies using a subtle and sensitive marker of cerebral ischemia, such as postoperative cognitive dysfunction, were recommended. Similarly, the group thought that prospectively utilizing surrogate markers of cerebral ischemia or flow such as PET scans, transcranial Doppler, BIS, NIRS, and EEG could be used to examine the effects of changes in position and blood pressure. The effects of vasoactive agents and fluid administration, head rotation, and other factors could also be examined. Lastly, the group thought that surgical studies examining outcomes in the sitting versus lateral positions were essential if we are to continue this practice. Group 2 addressed the question “What can companies do to make a difference?“ This group pointed out that the role of companies cannot be fully understood until we have a basic understanding and consensus about causes, risk factors, and effective preventive strategies. However, several technologies were identified as promising. The first recommendation was continuous, non-invasive blood pressure monitoring. This capability would allow tighter control of blood pressure. The second recommendation was a “smart alarm” that would operate in conjunction with automated anesthesia records. This smart alarm could signal the anesthesia team that a critical threshold—defined by factors such as blood pressure, table inclination, and duration of blood pressure change—had been exceeded. A system with a smart alarm could also supply data to a national registry, and this registry could strengthen our understanding of the relationship between critical thresholds, interventions, and outcomes. They recommended standardizing the degree of incline used in these procedures, which could be facilitated with the use of photographs. Group 2 emphasized 2 critical characteristics for cerebral function monitors—user-friendly function and non-invasive technology. The group also wondered if companies could design devices to regulate blood flow locally—within the shoulder joint—while leaving pressure and flow unchanged in the rest of the body. Lastly, they noted that surgeons should be educated on the potential risks associated with the use of deliberate hypotension in the beach chair position. Group 3 dealt with the question “What are the current best practices for blood pressure management?” The group began by pointing out that we do not have a generally accepted or validated method for defining a patient’s normal or baseline blood pressure. Similarly, we do not have a user friendly, noninvasive method for defining the lower limit of acceptable blood pressure for any given patient. As a general principle, Group 3 believed that blood pressure in the beach chair position should be adjusted to account for a hydrostatic gradient, and that deliberate hypotension should be avoided in the beach chair position. Most of the participants in the group believed that the maximum reduction from baseline pressure should be 30% with adjustment for any hydrostatic gradient in the sitting position. There was no consensus regarding how to raise the blood pressure with respect to fluid versus vasopressor administration. The group did not reach full agreement on whether non-invasive blood pressure monitoring was appropriate for all patients, but the group did agree that non-invasive measurements should be taken in the arm and not in the leg. Finally, Group 3 emphasized that the surgery and anesthesia teams must share decision-making and consent as it relates to blood pressure management in the beach chair position. Group 4 participants addressed the question “What should the APSF recommend as the next best steps?” Multiple suggestions were offered including: 1) Have the APSF fund a Request for Proposal (RFP) for a large (possibly multicenter) study with neurocognitive testing before and after surgery in the beach chair position with deliberate hypotension; 2) Increase awareness to a) the presence of a hydrostatic gradient between blood pressure at the arm and blood pressure in the head, b) keep blood pressure relatively normal, and c) keep head position relatively normal; 3) Have Dr. Stoelting contact orthopedic and surgical journals to provide commentary from the APSF regarding potential risks of deliberate hypotension; 4) Increase focus on informed consent and shared responsibility with the surgeon (also suggested by Group 3). The meeting was adjourned by Dr. Stoelting with general agreement from the audience and participants that significant research will be required to define safe hemodynamic management practices for surgery in the beach chair position. Lorri Lee is co-editor of the APSF Newsletter and Associate Professor of Anesthesiology at the University of Washington in Seattle, WA. Robert Caplan is member of the APSF Executive Committee and ASA Closed Claims Project as well as staff anesthesiologist at Virginia Mason Medical Center in Seattle, WA.